25 February 2010. Bristol. Naim today announced that deliveries would commence of FraimLite, a hi-fi support system optimised for Naim’s entry-level components. Few people would disagree with the statement that good hi-fi components perform at their best when well supported. They require a stable and level platform that isolates them mechanically. All components including power supplies micro-vibrate as a result of their own operation and from acoustic feedback from the very music that they are replaying. Ten years have passed since the original Fraim R&D project: the world’s economy is tough. There are many more support systems available – some good and some not so good and Naim’s entry-level products have never been better. It is time for a support system that is more affordable and more suited to Naim’s XS and entry-level Classic series. It is time for something that can bring the key benefits of Fraim and be more suited to smaller systems. The simple but highly interdependent requirements of a good support system require exceptional thinking to achieve a system in balance. A good support system lets the products it is supporting deliver to their very best, not exaggerating one aspect of performance over another. It offers stability and a freedom from microphony and isolation of components. FraimLite stands on three hardened stainless steel adjustable floor spikes to allow precise levelling. Each level is decoupled from the preceding level by a hardened stainless steel cup and cone interface connected by a precise stud. FraimLite forgoes Fraim’s second-level isolation of the toughened glass shelf supported by its innovative three-point socket and ball bearing system and the double isolation base level. Performance as a function of value for money is quite exceptional but of course it does not match the reference Fraim, especially in systems used at higher SPLs. It is, however, easier to set up and more suited to systems changing frequently. Naim expects to see many systems supported on FraimLite in retailers’ stores. Naim’s R&D team started development of the original Fraim support system over ten years ago. Initially, it was a project to allow them to understand the differences that different supports could bring, but research soon morphed into development and Fraim was launched. Fraim gave Naim a consistent platform to use for development, evaluation and of course demonstrations. Every Naim product in the last ten years was developed and evaluated using a system supported by Fraim. The common components of Fraim and FraimLite mean that a FraimLite system can easily and gradually upgraded to Fraim, on a level-by-level basis, which means that levels of either type can combine in one system. A system consisting predominantly of FraimLite could incorporate reference level Fraim shelving levels for critical source components. Fraim and FraimLite shelving level uprights are available in either black or natural anodised finish. Three different lengths – standard, medium and tall – are available to accommodate the different heights of Naim components from i series to the NAP500. 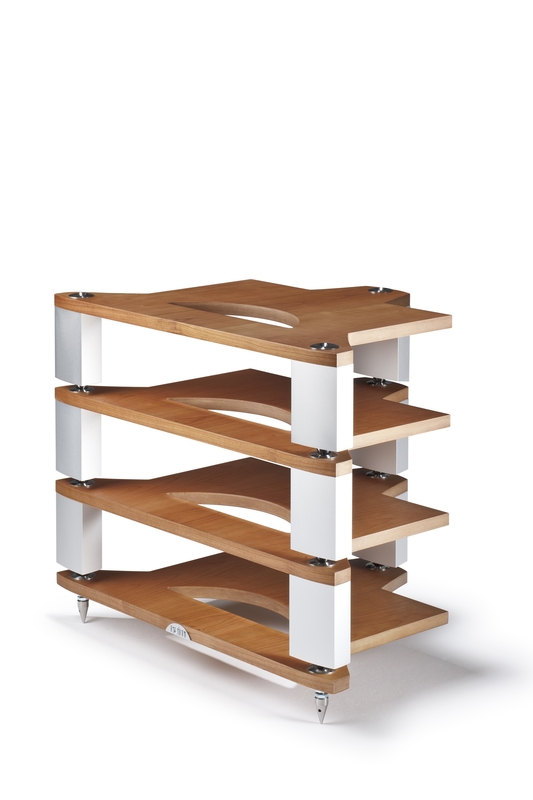 Fraim and FraimLite shelving panels are available in ash, cherry and black ash real wood veneers. These are manufactured in the same precision wood facility as the Ovator cabinets ensuring consistency in figure and tone. Three-point foundation – The tripod structure needs no adjustment over time, reduces vibration and prevents movement. Minimum contact interfaces – Inter-level cup and cone interfaces and (in the case of the reference Fraim) ball bearing minimal contact interface – all minimise microphony. Spacing –Shelf spacing minimises the magnetic field interaction of supported electronics. Uprights – Made deliberately wide to assist in the decoupling process. Material Selection – Stainless steel, hardened aluminium, toughened glass and custom-shaped wooden panels all selected through listening tests for their positive effect on sound quality. Glass sub-shelf and ball bearings – 10mm toughened glass selected from listening tests. Rests on ball bearing minimal contact interface to further decouple shelving level. Double base layer – Two base layers, as opposed to the FraimLite single base layer, with two sets of three cone and cup interfaces decouple the shelving levels from the ground.